As we celebrate Earth Month, the Lebanese Basketball Federation used a pre-game tradition to draw attention to a critical issue. The Federation and VMLY&R, with nonprofit Jouzour Loubnan, raised awareness of the decline of cedar trees in Lebanon due to deforestation. The central image of the Lebanese national flag is a cedar tree. If you remove the cedar from the flag, it resembles the flag of Austria. Before a game between two of the country’s most popular teams (Champville vs Beirut) broadcast on national television, when the crowd expected to hear the Lebanese national anthem, the moments were used to highlight the issue. 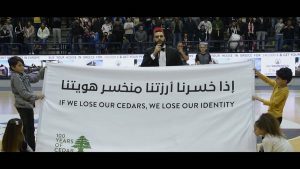 Instead of performing the Lebanese national anthem, it was replaced with the Austrian anthem and flag calling attention to the fact that without cedars, Lebanon loses its’ identity.